My second daughter will turn 7 tomorrow and requested for a Mama Mirabelle cake to share with her friends. Since her birthday falls on a Sunday, I have decided to get her to celebrate her birthday on Friday which was the 4th. My kids enjoy watching Mama Mirabelle at Cbeebies including myself *LOL* So here is the cake that I did for her. All are edible except for the ladybug which I purchased from Sun lik. They were just to cute !! This time round, I made the characters out of chocolate. I prepared them 2-3 days ahead because of my schedule. The extra fridge really helped me (I think I made a wise decision to purchased it :-P). The background as in the sky and the green are coloured piping gel. 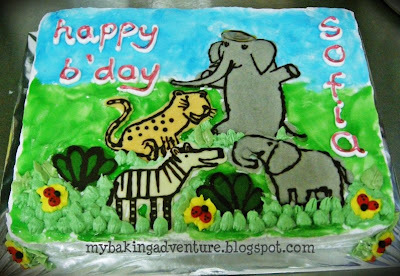 I actually would love to have this made with fondant but decided against it since many children don't like fondant or rather don't know how to eat them. All the rest are whipped cream. Ben 10 for the nephew ..